ST. JOHN'S, N.L. -- The first North Atlantic right whale to turn up dead in the Gulf of St. Lawrence was a 10-year-old male, back on June 7. Researchers had spotted it just six weeks earlier in Cape Cod Bay, looking healthy. Another was a vital 11-year-old female that might have added at least five to 10 calves to the dwindling population. Among the others: Two whales at least 17 and 37 years old, according to the New England Aquarium, which catalogues them through their distinctive white markings. The 10th and most recent carcass of the critically endangered species found in the gulf was reported Tuesday, a horrendous die-off not seen since the docile, curious creatures were hunted for their oily blubber in the 1800s. The federal Department of Fisheries said the "unprecedented number of right whale deaths is very concerning." 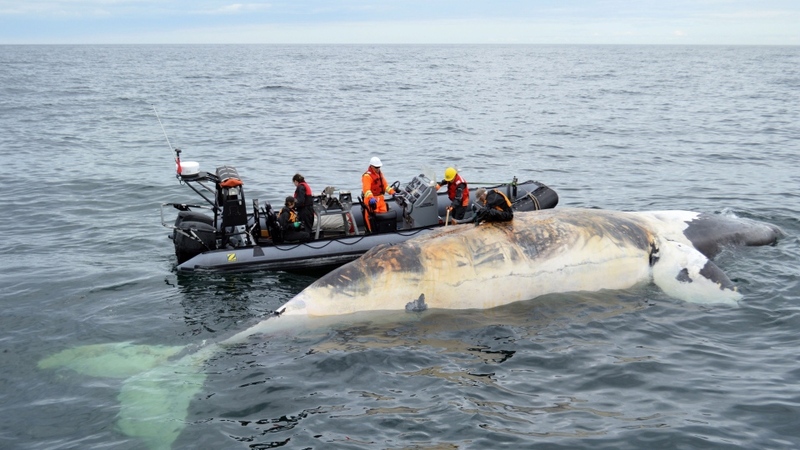 It's estimated there are only about 500 North Atlantic right whales still living, and Jerry Conway of the Canadian Whale Institute in Campobello, N.B., said the losses are disastrous for an already vulnerable species. "We feel there is tremendous urgency," he said Wednesday in an interview. "This has had catastrophic ramifications on the right whale population, this number of whales being killed when we only know of three calves being born this year. "It certainly indicates a rapid decline in the population." Fisheries and Oceans Minister Dominic LeBlanc will address the deaths in a Moncton, N.B., briefing Thursday. Fisheries officials say four of the carcasses were found off Newfoundland's west coast. They were discovered near Chimney Cove south of Trout River, Cape Ray in the Port Aux Basques region, Cedar Cove near Lark Harbour and one south of River of Ponds. "While we continue to work on confirming the identities of all four of these whales, we can confirm that at least two of them are new specimens not among the previously identified eight North Atlantic right whales spotted in the Gulf of St. Lawrence this summer," the department said in a news release. 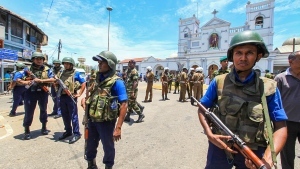 Necropsies, akin to animal autopsies, are underway on samples taken from the badly decomposed remains to help confirm causes of death, it said. The department said it has also taken steps to help protect the hefty plankton feeders that skim the surface with open mouths as they eat. They include closing a snow crab fishing zone in the southern Gulf of St. Lawrence, and asking gulf fishermen to report any whale sightings. Mariners have been asked to voluntarily cut speed along the Laurentian channel in shipping lanes between the Magdalen Islands to the Gaspe peninsula until Sept. 30. It has long been known that collisions with ships and fishing gear entanglements are major threats for right whales. A big question is whether the massive yet acrobatic mammals, which can reach 18 metres in length and live at least 75 years, have shifted habitat. Traditional feeding grounds include the Bay of Fundy and Roseway Basin, but the whales have increasingly appeared over the last five years in the gulf. Right whales prefer small crustaceans called copepods. Conway said moving shipping lanes to the east in the Bay of Fundy helped reduce ship strike potential by more than 90 per cent. Wayne Ledwell, head of Whale Release and Strandings in Newfoundland and Labrador, said the slow-moving feeders are in the gulf for a simple reason: to chase food. "If it's up in the Strait of Belle Isle or up off the Gaspe and the St. Lawrence that's where they're going to go, and I guess that's where a lot of them are right now. But obviously it's a dangerous place to be up there." Restricting fishing areas can be dicey as migration patterns and whale travel varies each season, Ledwell added. He stressed that fishermen work with his group to help free whales, but said the threat of fishery shut-downs could have unintended consequences for right whales, humpbacks and other species if fewer entanglements are reported. Tonya Wimmer, a director with the Marine Animal Response Society, said government, industry, harvesters and researchers must come up with solutions together. "This population can't sustain another hit like this," she said Wednesday from Dartmouth, N.S. "We don't even really know what this number of deaths will cause for the population, but they definitely can't handle it if this keeps happening over and over again." --With files from Alison Auld in Halifax. 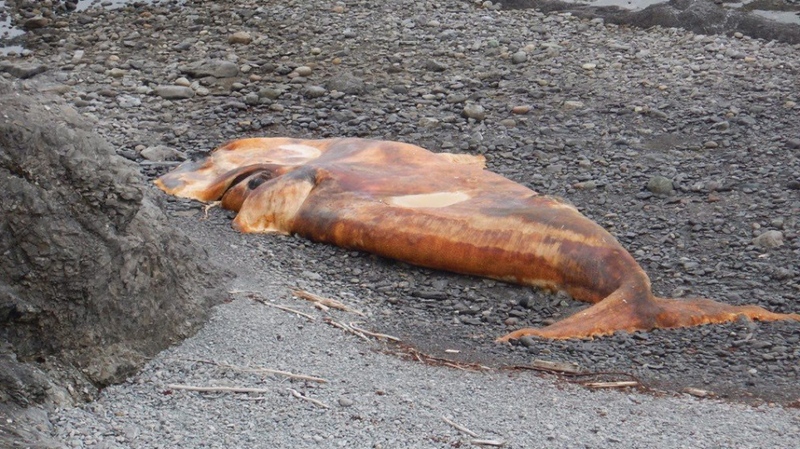 Fisheries officials hope to examine dead right whale that washed ashore in N.L.